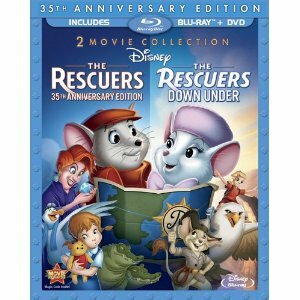 The Rescuers Down Under has the distinguished honor of being the first ever sequel from Walt Disney Animation Studios and it even had a much deserved theatrical release. It also had the difficult task of following the smash hit The Little Mermaid which marked an amazing come back for the studio. Mice in animation have always been popular but The Rescuers is a uniquely Disney franchise filled with adventure and fun characters. From a bayou diamond hunt against Madame Medusa to tracking a poacher in Australia, The Rescue Aid Society sends their best mice, Bernard and Bianca to save children in peril and meet lots of fun and interesting characters on the way. From the inventive and classic artistry of The Rescuers to the Stunning layouts and CGI enhancements of The Rescuers Down Under, the two films boast the state of the art technology and top-notch storytelling that Disney has always been known for. Featuring the voice talents of Bob Newhart and Eva Gabor, the stories follow two brave mice dedicated to helping children in need– one, a young orphan named Penny abducted by a wicked pawn shop owner in search of a diamond, the other an animal rescuer named Cody, kidnapped by a poacher who is hunting an extremely rare golden eagle– The two award-winning films are packaged together as one of Disney’s recent release of Blu-ray double features and include a True Life Adventure titled “Water Birds”, a sing-along video of the Oscar nominated song “Someone’s Waiting For You”, and the classic cartoon “Three Blind Mouseketeers”, plus a great behind the scenes look at the animation of The Rescuers Down Under.